We seldom get to see a sample of the Earth’s most common mineral. It resides within the mantle at extreme heat and pressure not found on the surface. We think that the mineral resides within the mantle – we are not sure, but it is a good hypothesis. However, the mineral stays hidden far below the crust, so we can’t be sure until someone goes down there and fetches a piece. Fifty years ago, a hypothesis was made that much of our planet is composed of a mineral designated MgSiO3-perovskite. Geologists estimate that 70% of the Earth’s lower mantle (670 to 2900 kilometers below us) is made of this one mineral. If true, it means 38% of the Earth’s volume is MgSiO3-perovskite. For 50 years, this probable existence of magnesium silicate perovskite was debated and generally accepted, but since no one had actually held a piece of it in their hands, the International Mineralogical Association could not approve a more catchy name for this most common of all minerals. According to the Mineralogical Association, a mineral cannot be given a name until there is physical proof of its natural existence. Tests must be performed on an actual physical sample, not an expected theoretical mineral. This, I suppose, is a policy that prevents amateur chemists from concocting imaginary minerals (“some of this, some of that, a little of this, and Presto! – let’s call it Canadaite.”) For 50 years, no one had analyzed hand-held samples of MgSiO3-perovskite. Now there is an identified sample – and the mineral has finally been given a real name. An Australian Tenham L6 chondrite meteorite – black blobs may contain the mystery mineral that is common in the Earth’s deep lower mantle. No one picked up the sample on a trip through the center of the Earth. Instead, it dropped out of the sky. Meteors, when they pass through the atmosphere and slam into our planet, are exposed to high pressure and temperature similar to those in the mantle. Scientists examined one of a group of meteorites called the Tenham L6 chondrites which hit near Tenham Station, Queensland, Australia, in 1879. 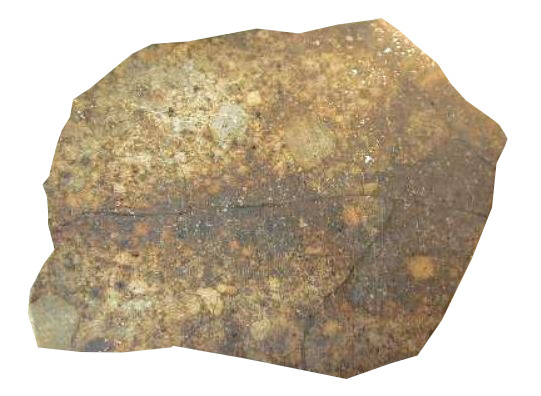 Over 160 kilograms (350 pounds) of this broken-up meteor were recovered. The examined piece shows evidence that the impact pressure was about 240,000 times sea level (24 gigapascal) and the temperature was about 2100 degrees Celsius. These values are remarkably similar to what scientists expect the lower mantle’s environment to be. Last month, researchers Oliver Tschauner of the University of Nevada and Chi Ma at Caltech reported in the journal Science that their work on the meteorite “concludes a half century of efforts to find, identify, and characterize a natural specimen of this important mineral.” The pair themselves had spent 5 years searching for MgSiO3-perovskite. The two conclusively identified tiny (30-micrometre) blobs of the mineral as the rumored magnesium silicate perovskite. With this positive identification, the material could be given a proper moniker. No, not Canadaite. Nor was it to be called Americium (that name was already taken and applied to element number 95). Instead, this most common – but most secluded – mineral has been named bridgmanite. “Who?” you ask. 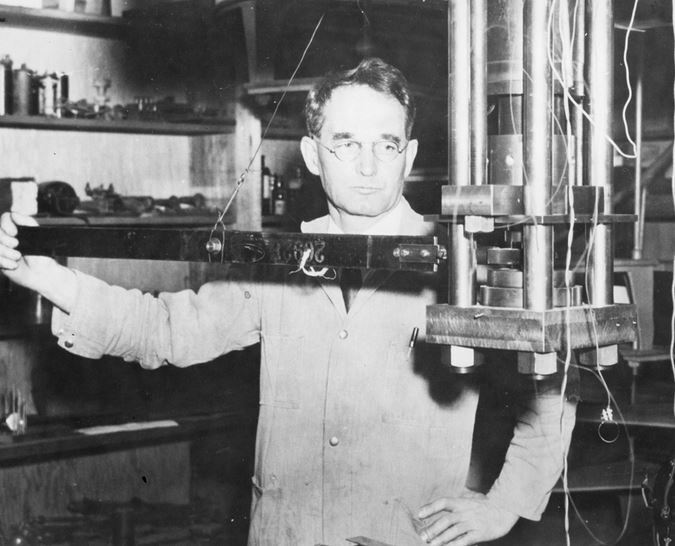 Percy Bridgman with his high-pressure experimental apparatus, around 1915. You might expect that the Earth’s most common mineral would be named for someone who did some amazing science. You would be right. Percy Bridgman is one of those great scientists of whom most of us have never heard. His expertise was the physics of enormous pressures. In 1905, when his machinery broke at his Harvard lab after pressing some material all the way to 3,000 times the Earth’s atmospheric pressure, he redesigned the apparatus and achieved 100,000 times atmospheric pressure. From thousands of experiments on tensile strength, viscosity, compressibility, electric and thermal conductivity of highly squeezed materials, he derived a set of basic equations which others have named the Bridgman Thermodynamics Equations. For this, Percy Bridgman was awarded the 1946 Nobel Prize in Physics. Bridgman, right, in his Harvard office. Some of the applications of Bridgman’s work worried him. 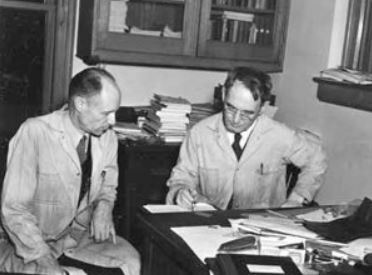 As head of the physics department, he had to sign off on the transfer of Harvard’s cyclotron to the US Army for the Manhattan Project in 1943. The American nuclear bomb project was top secret, so the military told Bridgman that they were taking his machine to St Louis where it would be used to treat wounded soldiers. Bridgman was no dummy. He told the military, “If you want it for what you say you want it for, you can’t have it. If you want it for what I think you want it for, of course you can have it.” His cyclotron went to Los Alamos (not St Louis) and was used to develop the atomic bomb, not medicinal isotopes, and he knew it. But after the war, Percy Bridgman saw the escalation of Soviet and American warheads as an impending disaster. Along with Joseph Rotblat, Linus Pauling, Max Born, Bertrand Russel, and Albert Einstein, he was one of the 11 signatories of the famous Russel-Einstein Manifesto, signed in Pugwash, Nova Scotia, in 1955. The manifesto called on world leaders to seek peaceful resolutions to international conflict and to find ways to disarm. The original meeting turned into the on-going Pugwash Conferences on Science and World Affairs. Bridgman was passionate about the philosophy of science and about the way science affects society. In 1927, he wrote The Logic of Modern Physics which had a major and surprising influence through the 1930s and 1940s on the social sciences. Bridgman’s main subject looked at how we know what we think we know. Particularly, he wrote about the methodology of physics. His intended audience included physical scientists. But through Bridgman’s introduction of operationalism, his book had a huge impact on the field of psychology. Operationalism is a variation of positivism, and positivism is the very basic idea that knowledge can only enter the human mind (and science) through observation and sensory experience – there is no role for intuition, introspection, or divine inspiration. 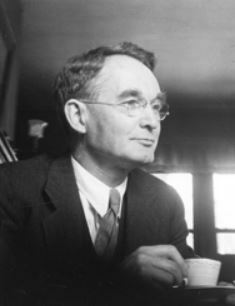 Positivism is not a new idea, but Percy Bridgman’s contribution was to move beyond its requirement for direct sensory validation. He included things that can not be directly measured but instead can be described by related elements which are readily observed. A common, everyday example of operationalism is measurement of the fuzzy idea of “health” in terms of empirical things like biomass, heart rate, and the number of trips to the hospital – things that can be counted and measured. From these, one gets a second-hand, but accurate, measurement of “health”. Similarly, the second-hand, measured side- effects of quantum mechanics and subatomic particles can define quantums and subparticles. This is important because it means that even if something can not be seen and directly measured, it can still be real – it is not the product of intuition, introspection, or inspiration. And this idea loops back to bridgmanite and geophysics. Geophysics (like astrophysics) is at an enormous disadvantage compared to chemistry, botany, newtonian physics, and most other sciences. The latter can be subjected to testable, experimental hypotheses. You might speculate that an upside-down seed will still send roots downward, so you experiment – you turn a seed upside-down and observe and measure the root’s growth. You test your guess by designing an experiment and measuring the results. You can’t do this in astrophysics – you can not crash two supernovae together in a controlled experiment. You might simulate your experiment with a computer model, but you can’t possibly include all the parameters you need to get the right answer. With the Earth, presumptions about the deep interior (including the existence of bridgmanite) have been indirectly confirmed. Ever since Sir William Gilbert deduced that the core is iron and is generating magnetism, up to modern observations that the crust is apparently burnt in places by fixed hot spots, discovering our planet’s inner workings has all been a series of indirect observations, followed by untestable hypotheses about what will never be seen. If a new observation negates an old hypothesis, the old hypothesis is revised or rejected. But there are no direct experiments and very few first-hand facts. You can see how all this ties Bridgman to the Earth’s most common and most secretive mineral, bridgmanite. Percy Bridgman gave us the tools to experiment with high pressure, creating environments similar to the lower mantle; but he also gave us the intellectual tools to trust the existence of things which we can only know second-hand. Ironically, the International Mineralogical Association says you can not name a mineral until you can prove its existence and hold it in your hands (positivism), yet MgSiO3-perovskite has been named bridgmanite to honour the man who said that measurable second-hand effects (operationalism) are good enough to prove that something exists – seen or unseen. This entry was posted in Biography, Geology, People, Philosophy and tagged Bridgman, bridgmanite, geology, heat physics, history, inner Earth, International Mineralogical Association, mantle, mineralogy, nuclear bombs, peace. Bookmark the permalink.